This week seems to be turning into a week of Christmas posts...what can I say, it's on my mind. With baby only weeks away I want to get all of my Christmas decorating and gifts in order so that I can enjoy my favorite holiday while I still have my wits about me. One of the vital purchases I wanted to make this year was a new set of family stockings. There is an excellent chance that Little Miss will be here before Christmas Day so I of course want to have a stocking hung and ready to go for her. Ideally, I would love to make our own stockings....make them really special and unique. But the reality is that a set of homemade stockings are a bit out of my reach at the mo'...so I turned to retail - Land's End to be exact. After much deliberation, we opted for these three stockings. I thought I would fall in love with a zillion different stockings but I ended up not really liking many that I saw - even on Etsy, which was a surprise. And Carter is a classic fella, so he hates anything that doesn't harken back to Christmases of yore (having Carter on board was crucial as I once made the mistake of purchasing a stocking for him that suited both my taste and decor and he hated it...lots). 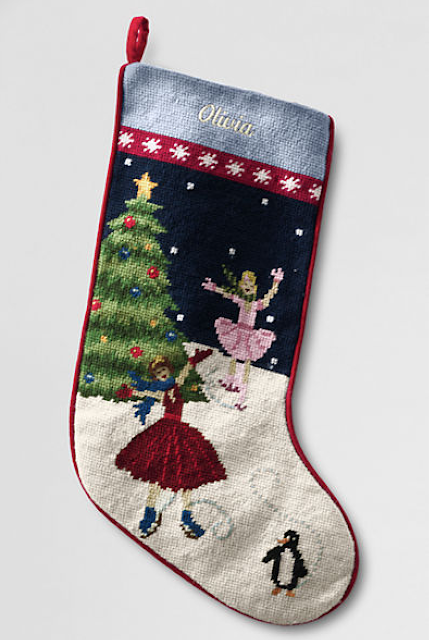 We both really liked the needlepoint construction of these and what clinched the deal was the adorable stocking for baby girl...that penguin is too cute and I love the pink + red ice skaters...they fit nicely with baby's signature color palette. Stockings seem to always be a special part of family Christmas decor. I remember my own from childhood very fondly. And Carter's were handmade by his grandmother. 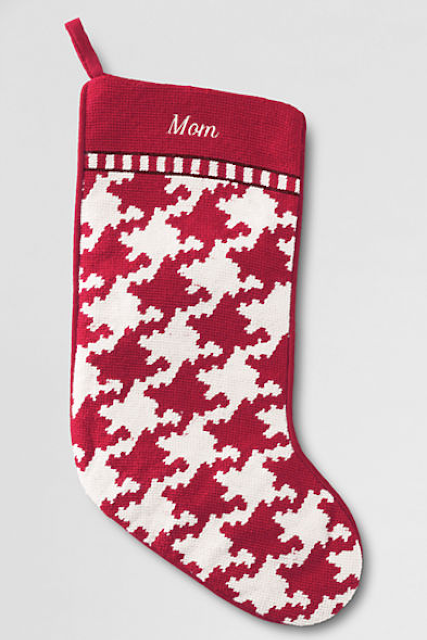 Do you have special stockings with a story in your family? Are you really naming baby girl "Olivia????" No! Though I do like the name...it's just the image from the Land's End website :) Should have made that clear! Very nice! I have a hand knitted stocking from childhood. I still love it. On it Santa's beard is angora and there is a jingle bell on his hat. It has my name on it but I wished I could have used it for the youngest child each year. Yes! Stockings have been very important for our family too. We didn't really "get it together" until daughter was about four, but we each have one and treasure it. Even the dog had a cute little one (she loved....the tissue paper more than anybody!). When are you actually due? My Grandmother made needlepoint stockings for my sisters and me when we were children. 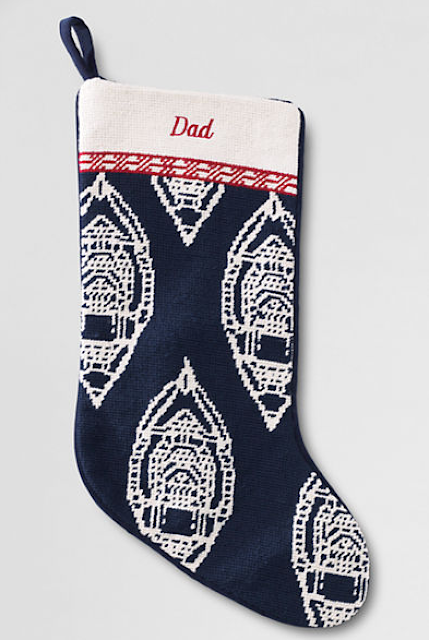 I purchased the Lands End ones for my husband and 3 sons (in addition to one for myself that says "Mom") because I can't needle point, but love the old fashion feel of a needlepoint stocking. I still have my stocking from childhood--a handmade, lovely felt stocking made by a great aunt. Todd also has his childhood felt stocking. But once Davis was born, my mother had a friend of hers knit stockings for our new family. We chose the designs (snowman for Davis, Christmas tree for Todd, gift-wrapped presents for me). Love them.